Designed by Al Lowe and Josh Mandel, Freddy Pharkas: Frontier Pharmacist was one of Sierra's lesser known but better games. Freddy Pharkas is set in the Wild West, and involves some great writing, lots of very silly humour, excellent VGA graphics, solid puzzles, and lots of vintage medicine. 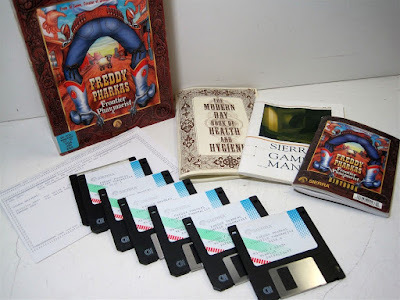 Own it by bidding on this Freddy Pharkas: Frontier Pharmacist (MS-DOS) eBay auction. You'll be bidding on a boxed copy of the VGA/EGA 3.5" floppy disk version of the game. Included are the disks, manuals, and hintbook. Seller ships to the United States, Europe, Canada, Japan, and Australia. This is probably my favorite game of all time. It is truly unique and one of the funniest games I have ever played. It is indeed excellent; one of Sierra's very best!